without burnt or bitter after taste. 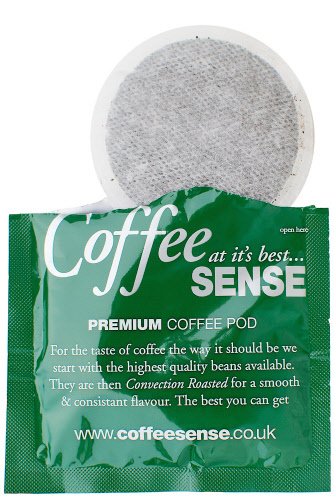 Coffee Sense packages these pods in an oxygen free environment, making this coffee the freshest brew possible. You'll smell and taste the difference from the moment you tear open the first packet. For use in Philips Senseo Coffee machines etc. A pod is a measured portion of ground coffee or espresso, compressed between two biodegradable filter paper sheets. By using a coffee or espresso maker specifically designed for use with pods, the pod allows anyone to make an excellent cup of coffee or espresso in no time. Pods are easy to use, convenient and mess free, providing a consistently delicious freshly brewed cup of coffee. A breakthrough in quality single-cup coffee! JavaOne™ is the solution to your single-cup coffee needs - combining quality taste with the ease and convenience of a single-cup! JavaOne™ pods work with a variety of single-cup brewers for maximum flexibility. The gourmet selection offers the perfect coffees - light roasts, exotic estate coffees, flavored, and decaffeinated as well as premium hand-picked teas. Convenience, choice and a gourmet selection! 100% Arabica coffees from premier growing regions around the globe are roasted in small batches on our patented convection roasting system. This unique method ensures an even roast throughout the bean resulting in a smooth and consistent flavor in every cup. Each JavaOne™ pod is individually wrapped to ensure maximum freshness. Pods maintain their shape for perfect brewing. This Colombian Supremo coffee is of only the highest grade 100% Colombian beans, roasted to the perfect degree to unlock the distinct flavor of these world-famous bean. This is the classic all-day, anytime coffee!